Our cable sizing tool is one of the more popular tools on the site. The tool enables cables to be sized in compliance with BS 7671 (the IEE Wiring Regulations) and by implication IEC 60364. This post gives some insight into how the tool works, the calculations carried out and how to use it. With the tool being based on BS 7671, this post will also provide an introduction and explanation of the cable sizing method given in the standard. Any errors or warnings generated during the calculation are passed on the the user. In addition to cable size the tool also calculates the cable impedance and fault levels at the load end of the cable. The calculation method follows the procedures given in BS 7671:2008 (the IEE Wiring Regulations), 17th Edition. By considering any correction factors, the tabled current for a cable installed in a given situation can be found. Once the tabled value of current is found, the cable size is determined by selecting the next largest cross sectional area in the lookup tables. 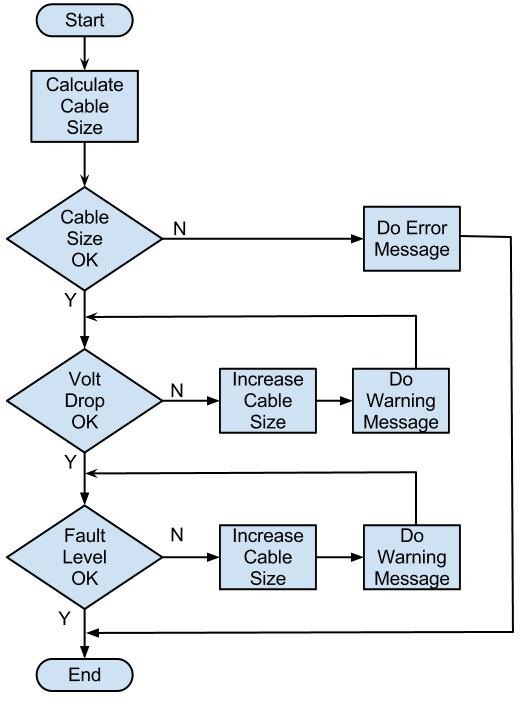 Voltage drop calculations consider both the power factor of the system and a correction factor for the cable operating standard. Tables 4D1B to 4J4B of the standard give voltage drops (resistive and reactive) in (mV/A/m), which is equivalent to mΩ/m (or Ω/m if adjusted). Note: the tool carries out all calculations in complex form. How does the tool taking into account parallel conductors? Additional parallel cables are automatically added to group derating (you don't need to increase this manually). You can click the ignore checkbox to change this (for example if your cables are more than two diameters apart). : code changes have been made. The updated version of the calculator is now live. What exactly is the No.Circuits/Cables? Group derating takes into account heat generated by adjacent cables. Each circuit is usually supplied by one cable and the number of circuits will equal the number of cables. Sometimes several cables are run a parallel for a single circuit and this will increase the total number of cables (and group derating). Tip: if cables are spaced more than twice their overall diameter apart, then no group derating is required. Ct = Temperature Correction Factor to account for the actual temperature reached with load current flowing taking into account the heating effect of grouping and ambient temperature. Tp = Maximum Operating Temperature of the conductor (for PVC = 70 deg C and for XLPE = 90 deg C). Ca = Ambient Temperature Correction Factor. Cg = Grouping Correction Factor. Ib = Design Load Current (in Amps). It = Tabulated Continuous Current Carrying Capacity or Current Rating of Conductor at 30 deg C (in Amps). 30 = The Ambient Temperature (in deg C) the tabulated cable current ratings are designed to. This is a really good point and I have been looking at the tables and trying to get my head around this. To me, the 20oC appears to only apply when looking at the current rating where Ct is not used (Ct is only for voltage drop). For the voltage drop tables there is only one figure given for the resistance (regardless if buried our not). I guess this figure is calculated on 30oC and the equation for Ct given in the regulations is correct. I only have a copy of the 16th edition of the IEE Regs so maybe it is different in the 17th, but I can't see any reference to 20 deg C only being used when Ct is not used. So I'm figuring that to apply the Ct correction factor to the mV/A/M values derived from Table 4D4B for cable in underground duct then th appearance of 30 deg C in this Ct formula would be meangingless as we don't have 30 deg there to start with, we have 20 deg C and the mv/A/M values are for a conductor temperature of 70 deg C in an ambient temp of 20 deg C, so if the ambient temp in duct changes to a different temperature then Tp - 20 would seem more appropriate than Tp - 30 ?? Gilly, I still think for the time being I am going to stick with the view that the equation is correct (we may agree to disagree until we get a third opinion). I can see where you are coming from with the tp-30 and it may be that this should be tp-20. However, I also think that the 20oC could be taken into account by the Ib2/It2 (where It has been calculated at 20oC). Possibly the tp-30 is because the resistivity used was taken at 30oC. Without knowing the how the equation was derived, it’s a bit of guess work. It may be possible to get a better handle on this, by trying to derive a similar equation from basics and see what it looks like. At the moment I don’t have time to look at something like this at the moment, but it’s something I may do in the future. Does anyone know can you email IEE directly with such queries ?? Regarding to checking the voltage drop at end point, does your Cable Sizing tool consider the network impedance or no? For calculating the voltage drop at starting, if we only consider the cable impedance, that means we have considered the "nominal voltage" on the supply bus, while, as you know, during motor starting the voltage on the bus is not "nominal" and will be decreased depending on the network impedance. Thanks for the excellent comment and question. Quick answer is that the tool only considers the cable current and cable impedance in determining the voltage drop. It does not consider the source (network) impedance. Since receiving your comment, I have given some thought to possibly adding an option within the tool to include the source impedance in the calculation. At the moment I can't see how this would be helpful. On a typical system, many cables are connected to the source. The current (and voltage drop) within the source is dependant on the sum of all the currents in all the connected cables. 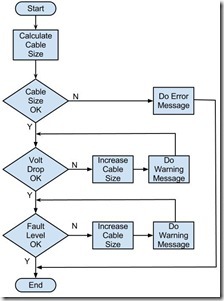 If we based the calculation of source voltage drop on just a single cable, the results would be wrong. I think this would lead to confusion or problems for many of the tool users. Thank you for your quick and clear response. ,please note that usually at normal operation when all the cables(loads) are connected to source(switchgear), voltage on the switchgear shall be remained around bus nominal voltage by adjusting transformers tap changers. ( Our calculations by ETAP show that the voltage on the switchgear bus bars are a bit more than nominal voltage), so we shall not worry about voltage drop on the switchgear bus bars due to all other connected cables to switchgear. I think we shall just check the voltage drop on the bus (due to source impedance) only for that single cable. For the loads near source we can disregard extra calculation, but for the cases far from the source this may cause the motors can not run successfully at starting. The netwrok impedance(including transformers and cable from transformer to switchgear) can be calculated by adding the min short circuit on the bus bar(derived from calculations). Sorry for my long query. If your using ETAP, I think you have everything you need to be able to solve your issue. With the cable and motor modules, are you not able fully to analyse your system in ETAP. If you don't have the modules, you can use ETAP to get the voltage drop to the busbar supplying the cable and knowing your total allowable voltage drop you have a maximum voltage drop requirement for our cable sizing tool. Alternatively, you can use the network impedance from ETAP, cable impedance from the sizing tool and put together a spreadsheet to do the calculations (normal operation and starting) and see what voltage drops you are coming up with. In this scenario, you can just use the tool to size for current capacity and modify cable sizes based on the spreadsheet voltage drops. These are just some suggestions. Hope you are able to find away to solve your problem. I do think you have a very interesting assignment and it would be great if you can give us feedback on how you finally resolve this. Our ETAP software contains the cable and motor moudule also, but we have an excel based internal software for cable sizing and other electrical activities. Before, this software didn’t considered the voltage drop on the bus for cable sizing due to source impedance, but recently we have added an extra module for this case. In calculation, Which one you consider for voltage drop calculation: AC resistance or DC resistance of conductors? For ac cables the ac resistance is used (for dc the dc resistance).